3d. 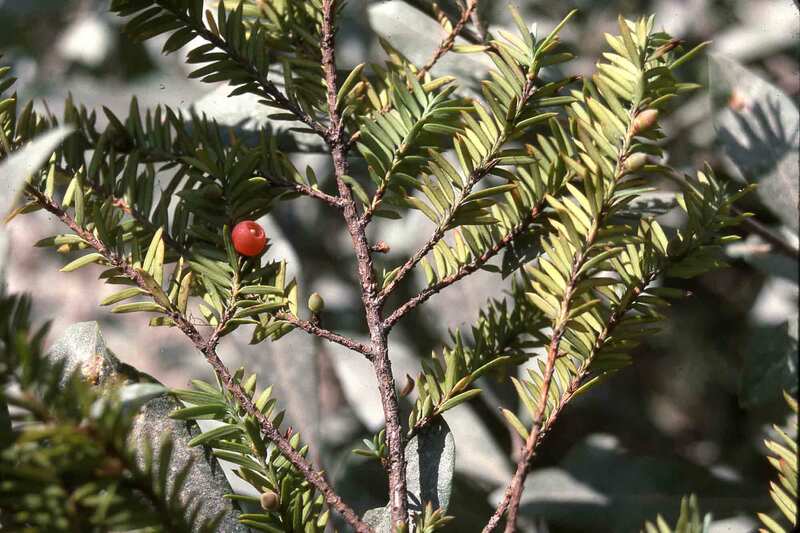 Taxus brevifolia var. reptaneta Spjut, J. Bot. Res. Inst. Texas 1 (1): 219. 2007— Type: U.S.A., California, near corner of Humboldt, Siskiyou and Trinity Counties, 17 mi S of the town of the Forks of the Salmon on McNeal Creek Road, Knownothing Creek, ca. 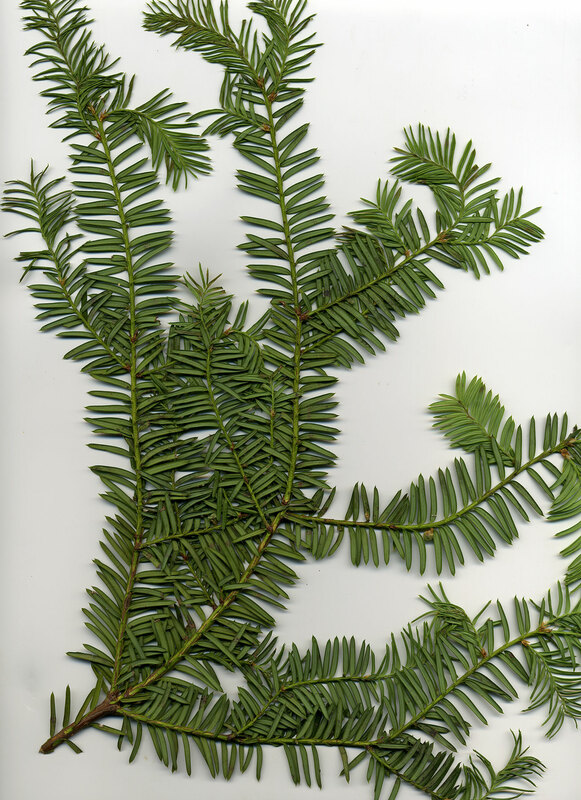 1300 m, shrub with long scandent stems ascending to 5 m or more, stems layering, R. Spjut & T. Spjut 11835, with seed—holotype US (isotypes: BM BRIT E GH HSC K). 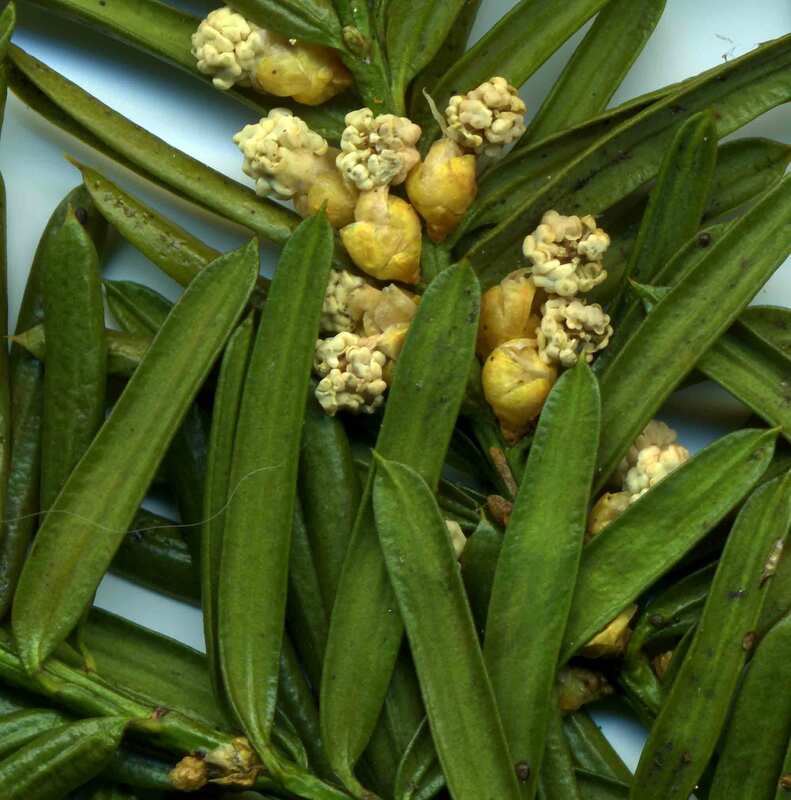 Note: A combination attributed to Silba, Taxus brevifolia subsp. reptaneta with reference to "J. Int. Conifer Preserv. Soc. 17(1): 22. 2010" (n.v.) is not consistent with the taxonomic history of the genus as noted above under var. polychaeta. 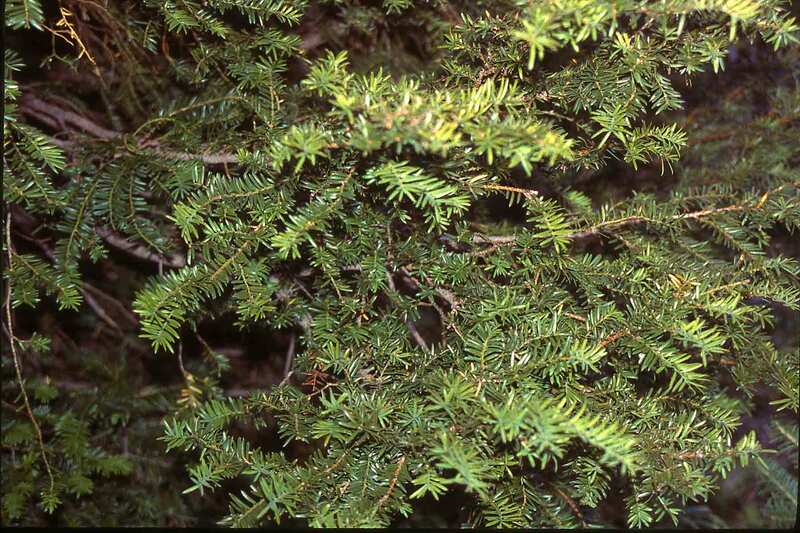 Diagnostic features: Shrubs with ascending stems near base, or ascending from a prostrate trunk; vegetative reproduction often by layering, forming clonal thickets or genets with many ramets; branches usually spreading in one direction, ascending, horizontal or descending, usually with a slightly drooping leader; ovuliferous shoots with a relatively short primary shoot as in var. brevifolia, with one terminal ovule. or with two subterminal ovules observed in approximately 25% of the female genets (based on limited surveys in 2010). 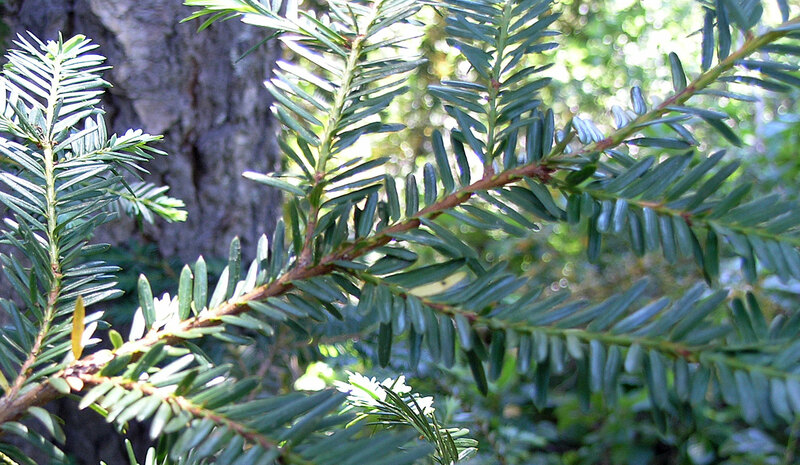 Thicket yew. NW U.S.A. 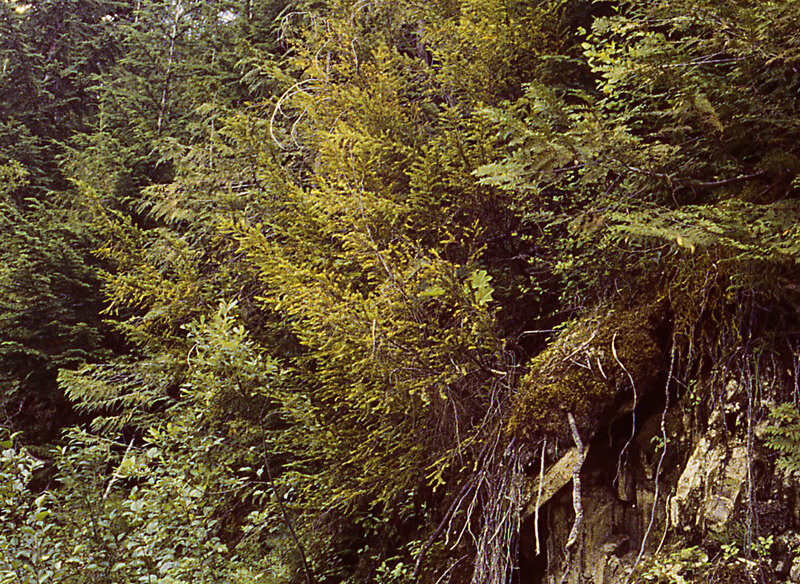 Scattered or forming dense thickets on steep sunny slopes of avalanche shoots, along streams, or in dense shade of bottomland ravines, 1000–2000 m; Rocky Mountains—Idaho, Montana, British Columbia; E Cascades—Oregon and Washington, Klamath Mountains—Oregon and California; Coast Ranges—Oregon. The layering habit of var. reptaneta varies. 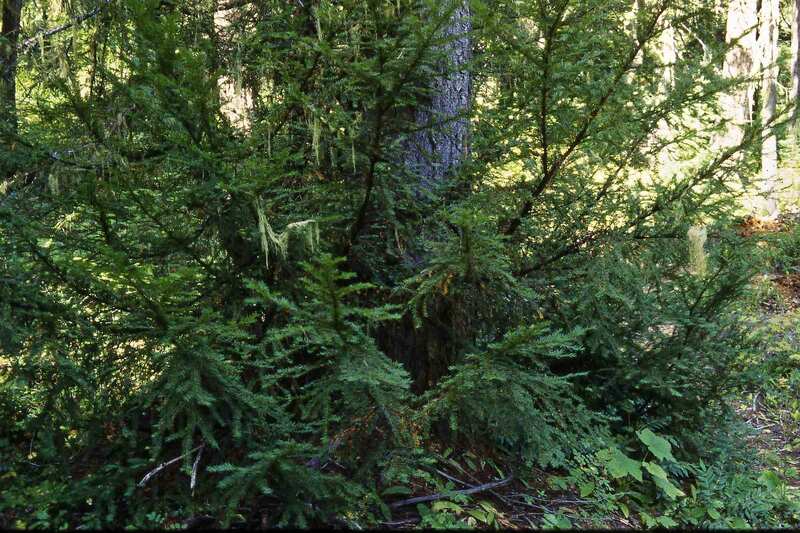 The variety at the type locality and in NW Montana, which occurs in open riparian habitats, has thick trunks—more than 50 cm in diam.—that ascend to 5 m or more in length. These bear numerous divaricate to ascending branches sometmes longer than that of the main trunk. 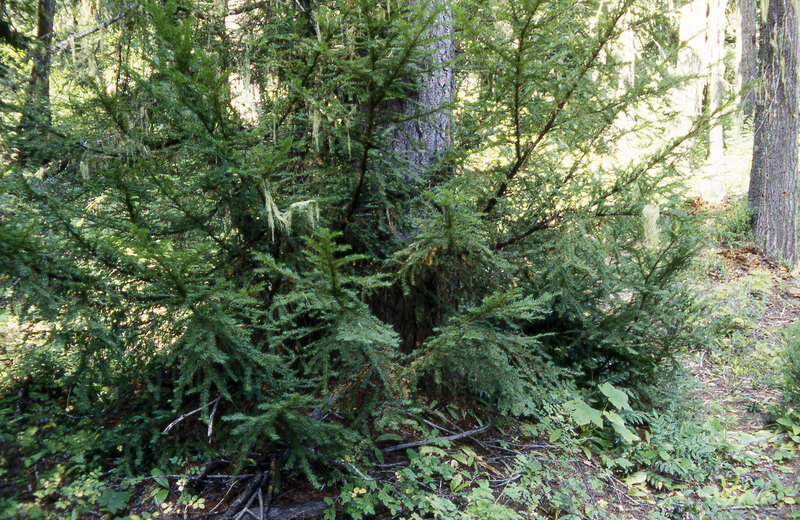 New trunks develop from layering branches within less than 5 m. Collectively, they form impenetrable yew thickets—as I have observed on sun-exposed avalanche shoots in the Kootenai National Forest of NW Montana, and on steep slopes bordering streams in the Klamath Mountains of California (type locality); hence, the epithet, reptaneta. 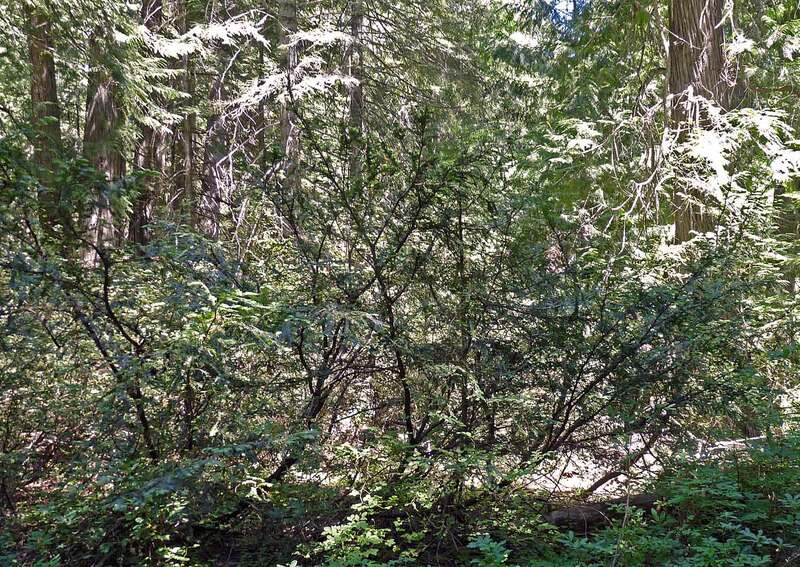 Another form, which occurs in understory of old-growth bottomland (valley) forests along the E slopes of the Cascades, has more scattered genets, and their trunks sometimes twist and wrap around the base of grand fir and other trees as if ecologically dependent upon them. 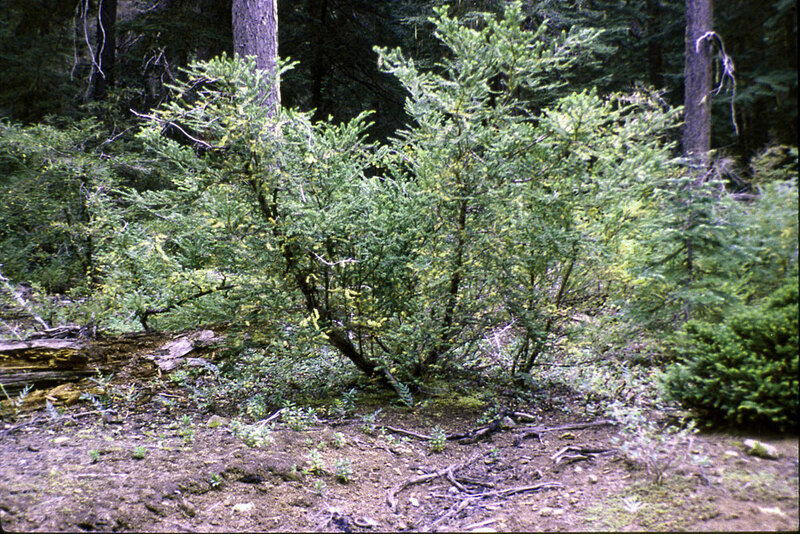 Another form of a much lower stature hardly differs from that of T. canadensis, except for its leaf anatomy; it is common in the Rocky Mountains. 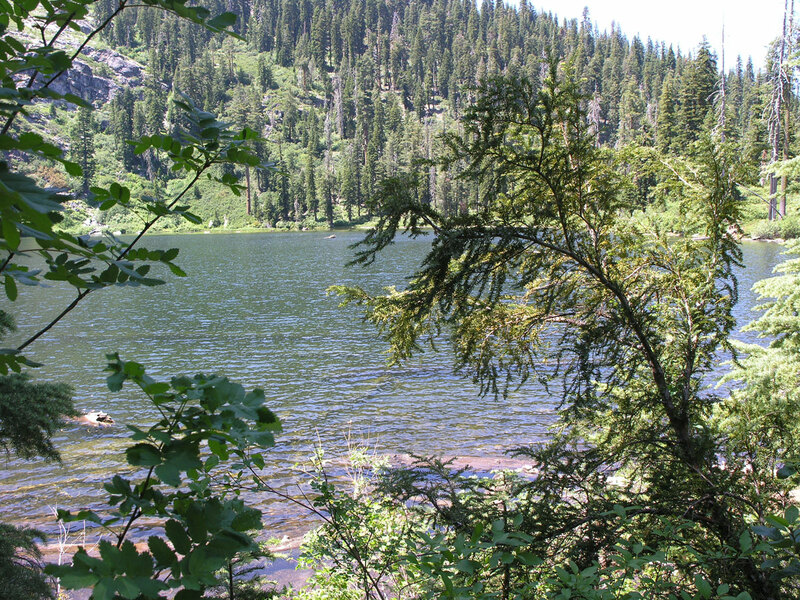 Lake of the Island, 5,650–6,000 ft. 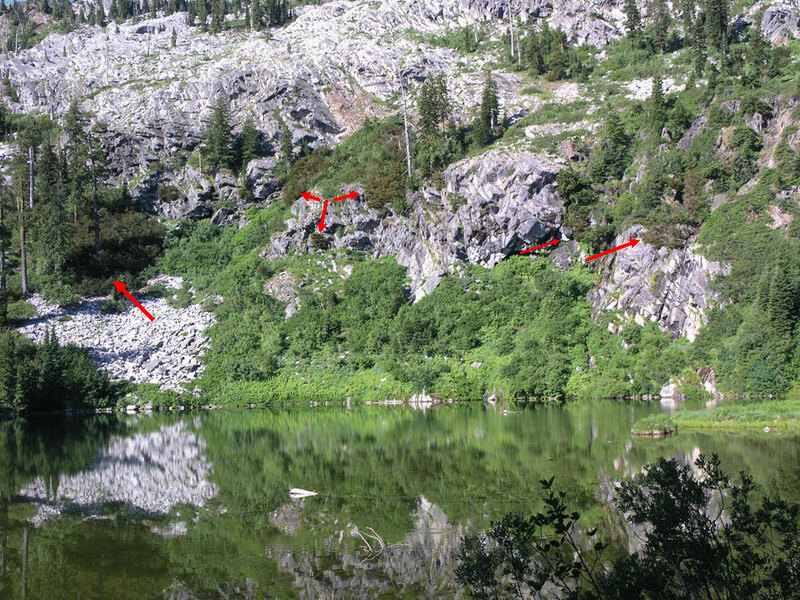 Arrows in upper left photo point to yew thickets on north to northeast exposures, occurring on almost vertical rock faces and steep talus slopes, generally of diorite; Spjut 16013, July 2006. 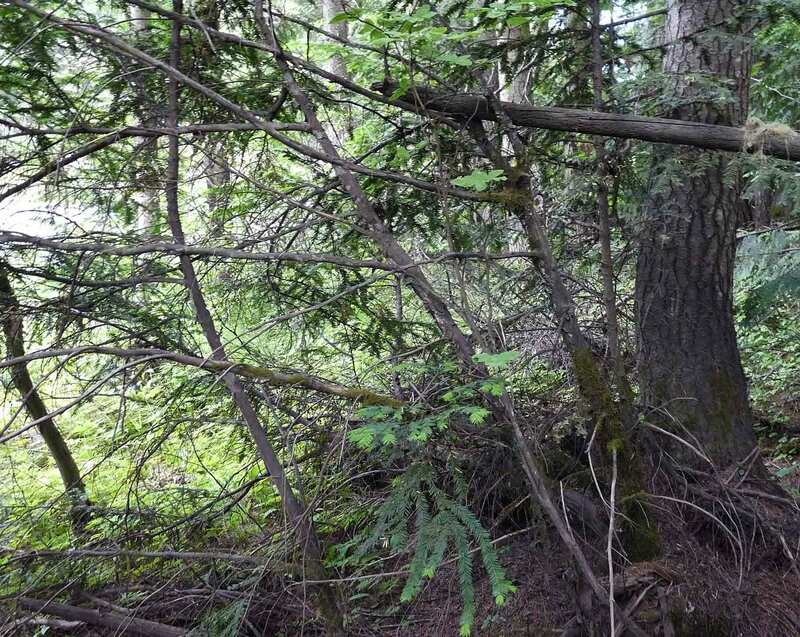 Upper right photo shows closer view of yew thicket. 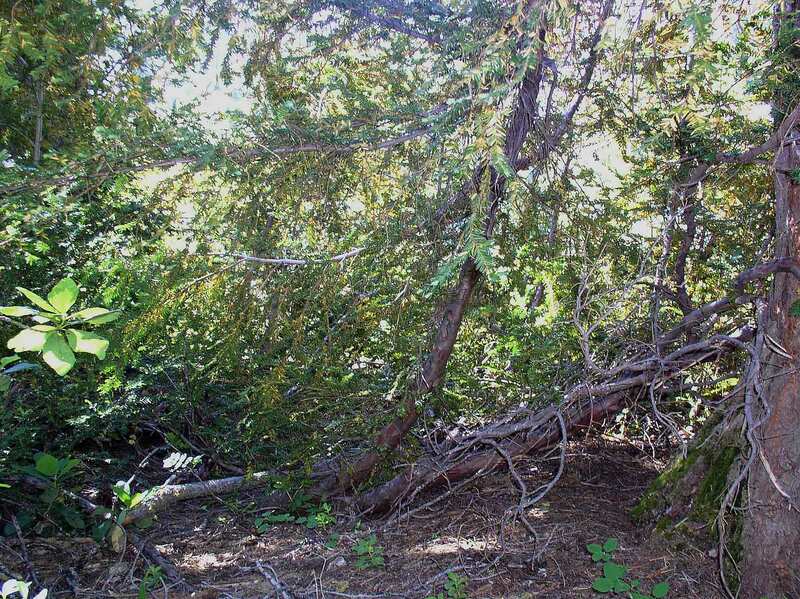 Lower left photo shows tangled growth of branches, which appear difficult to walk through. 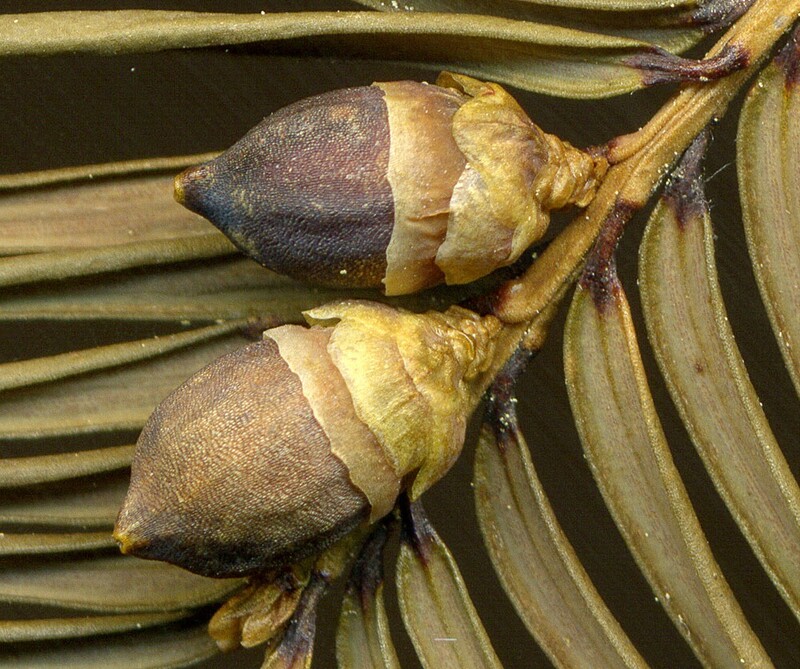 Lower photos show male cones found on all plants examined in one thicket, as would be expected from plants that layer. 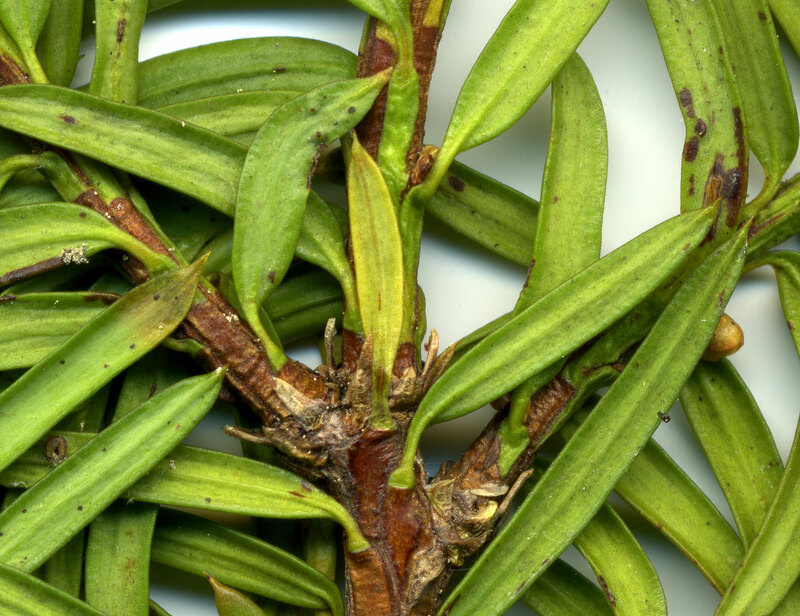 Note the trailing stems along ground in lower left photo. 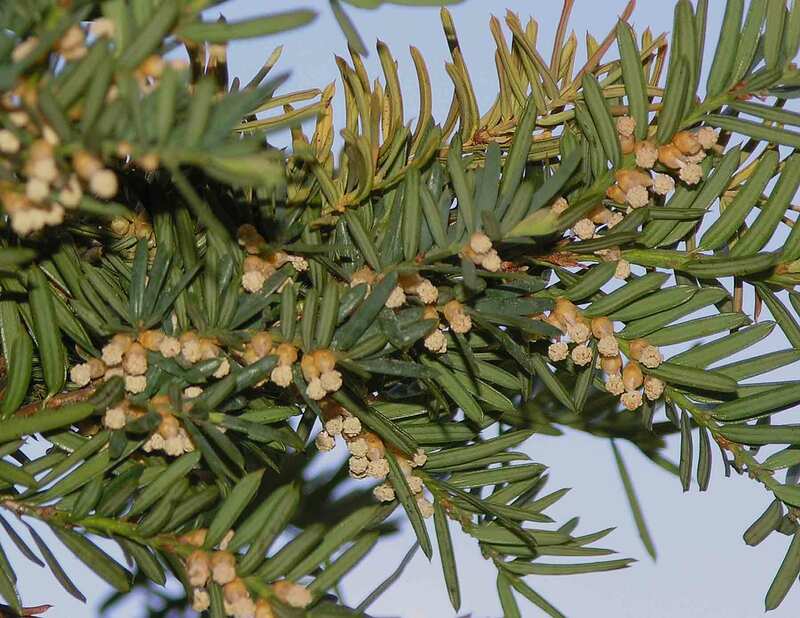 Occurring with red fir, mountain hemlock, white fir, silver fir, western white pine, incense cedar, and subalpine fir (very rare). 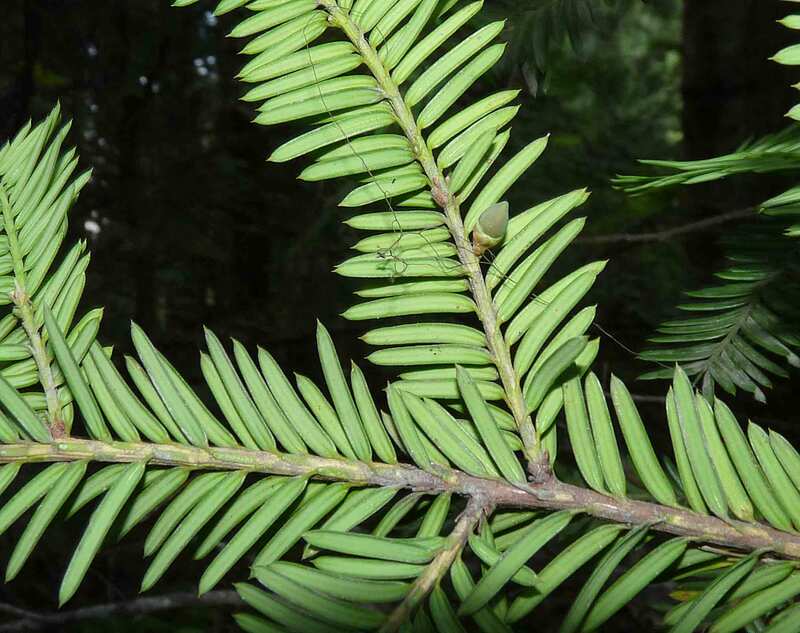 Douglas fir occurring just below the lake along the trail at 5,400 ft. An orange color appearing on older leaves of many plants is an apparent disease that I have not generally seen on yew. 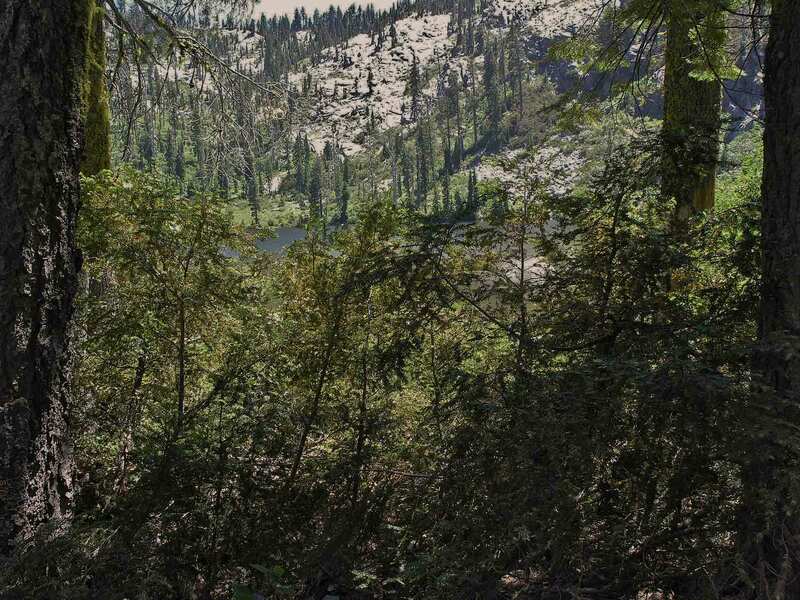 California: Marble Mountain Wilderness, Lake-of-the- Island, small thicket along north shore, 5650 ft. Here the ground is level, but the plants still show the ascending stems as if growing on steep slopes. Note the bare stem on one side, and branches spreading to the other side—all towards the lake. 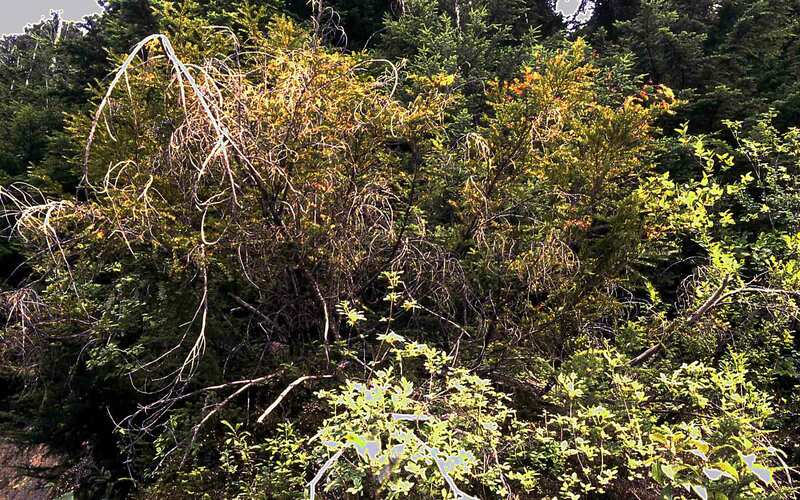 Plants in this thicket were entirely female in contrast to male thickets seen elsewhere around the lake. Spjut 16015, July 2006. Lake of the Island, small thicket along east shore, 5800 ft. Spjut 16014, July 2006. Idaho: . Shoshone Co.: Hobo Cedar Grove Botanical Area, St Joe NF. 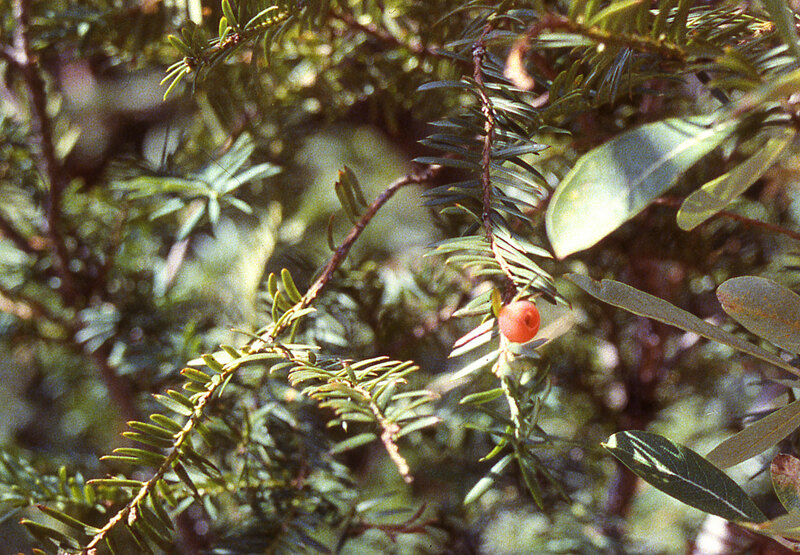 Taxus brevifolia var. 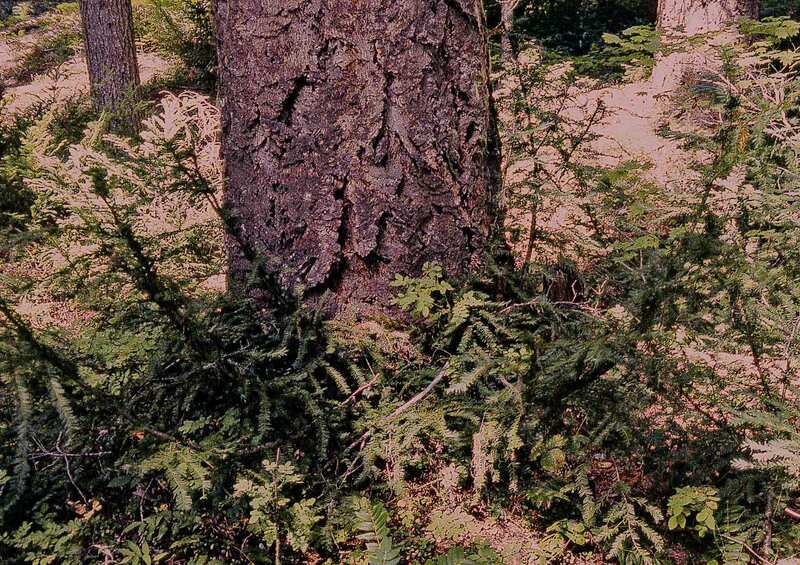 reptaneta, a predominant understory shrub in an old growth forest of largely western red cedar. Photo shows genet with many ramets, each ramet with ascending stems and branching to one side, forming dense thickets; male genets more common than female genets, representing perhaps 2/3 or more of all genets in population; one female found with biovulate shoot. Nine samples from different genets: Male-A,B,D,F,G; female-C,E,H (biovulate) and I. , SPJ-16734, 18 July 2010. California. 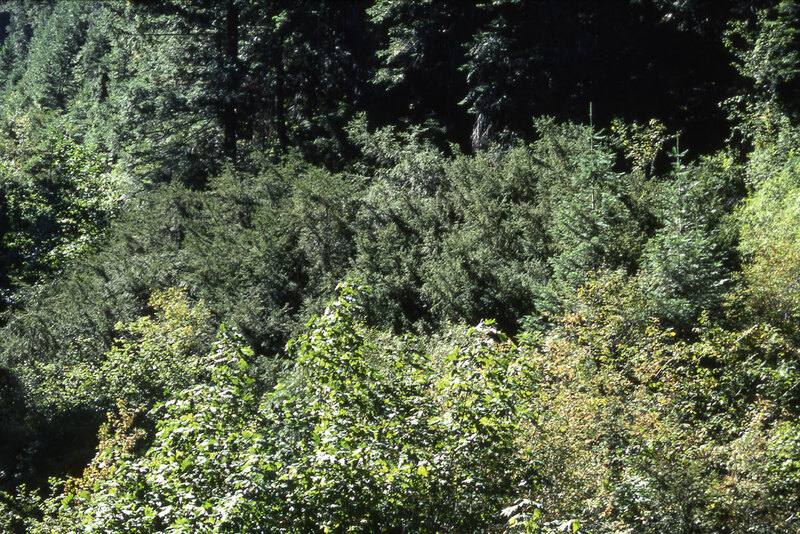 Siskiyou Co.: Type locality, Knownothing Creek, 17 mi S of the Forks-of-the-Salmon town. 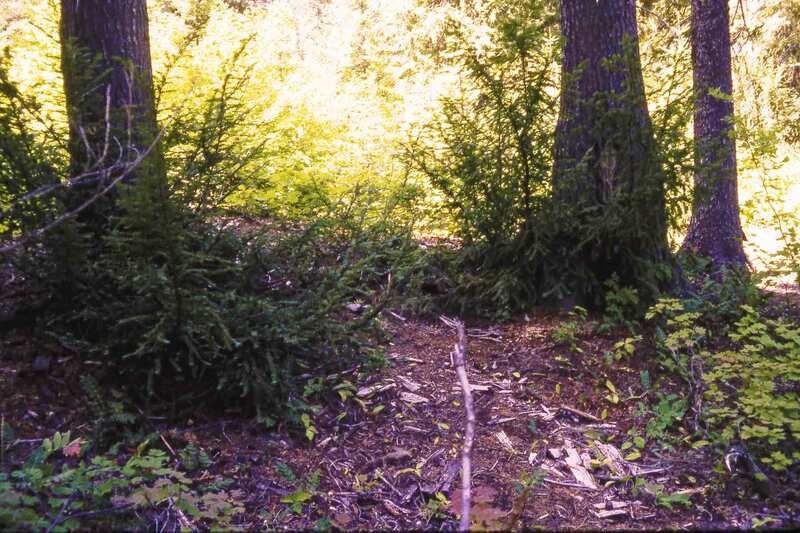 Left photo shows yew thicket. Aug. 1991. California. Siskiyou Co. 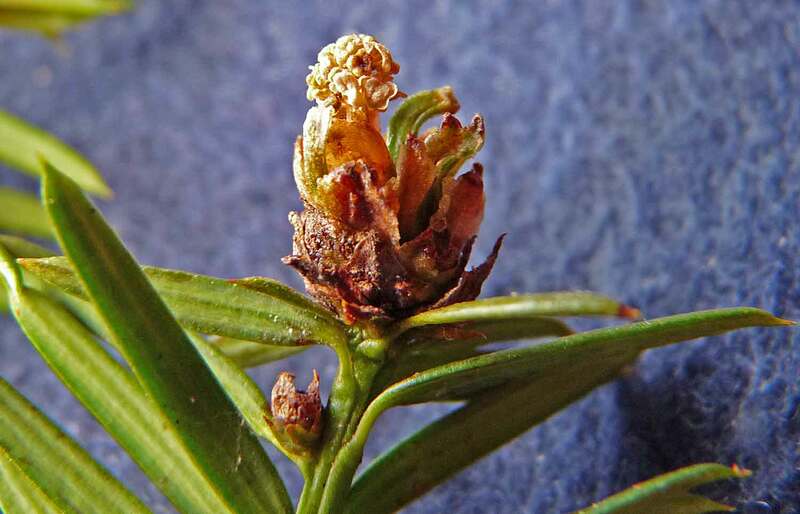 Male cone, a strobilus and bud-scale-dwarf-shoot and leaf complex at the end of a primary (fertile) shoot of Taxus brevifolia var. reptaneta from type locality (Spjut 16717). Photo taken July 2010. 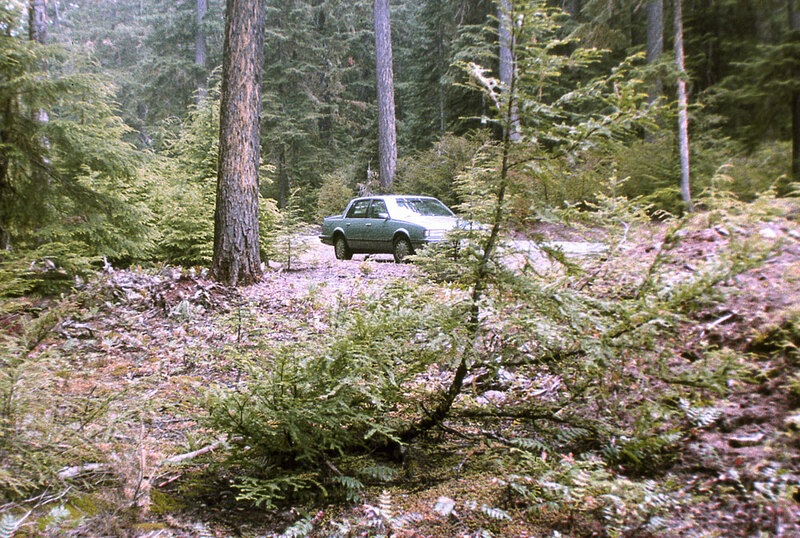 Washington—Cascades: Washington National Forest, 18 mi S of Leavenworth, Icicle Creek, Black Pine Horse Camp, scattered or forming open thickets locally on flats or gentle slopes in understory of old growth coniferous forest with Engelmann spruce, Douglas fir, incense cedar, grand fir, sugar pine and ponderosa pine, 47º36 N, 120º56.70W, 3050 ft, Spjut 12101 (5 Aug 1991), 12302 (15 Aug 1992). 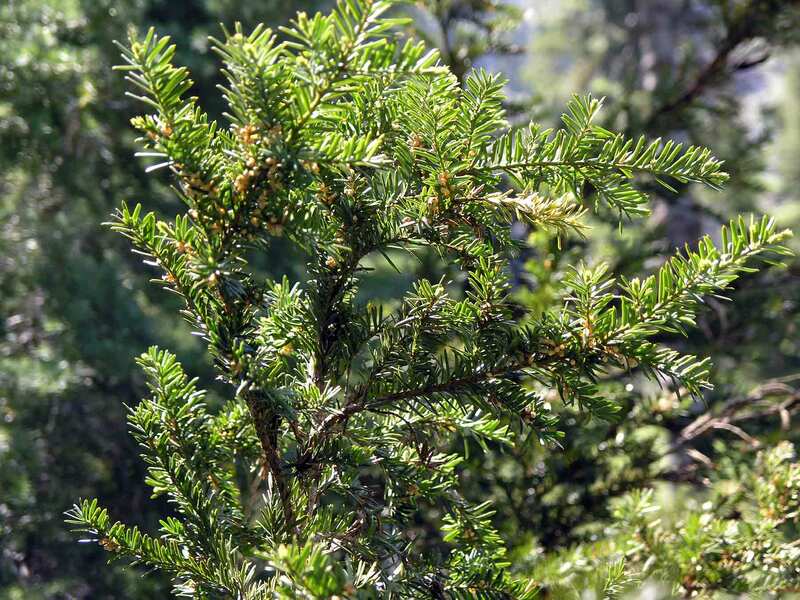 At this site, thicket yew seemed to show a definite close association with other conifers by growing around their base as evident in the above photos. Lower right photo shows yellowish seed attached to branch. 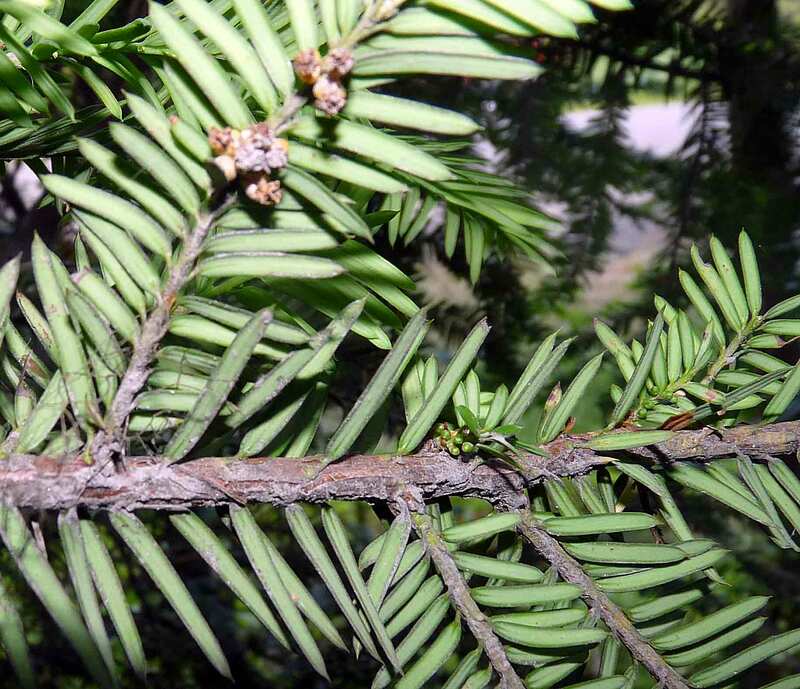 Lichen growth on yew branches indicate that yew plants are not young. 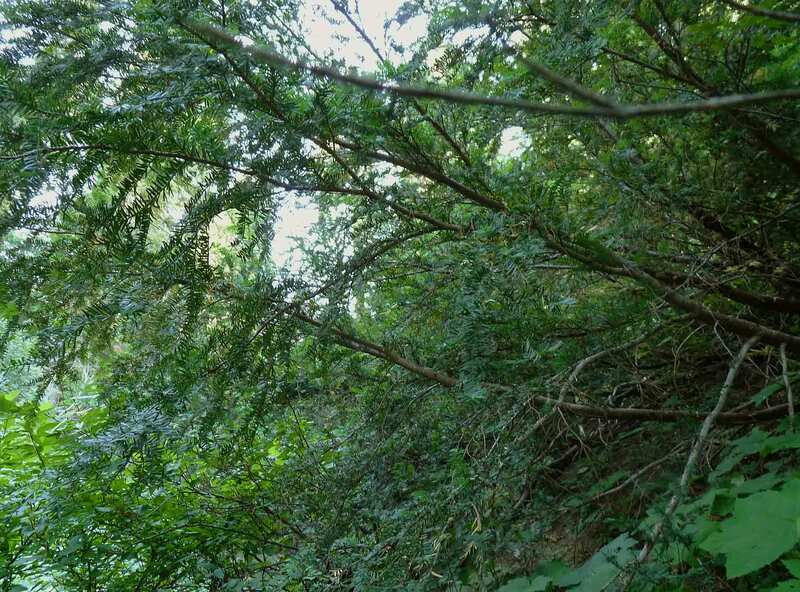 In July 2010, the plants studied earlier apparentlyh were washed out from river flooding; the other conifers were still there but not the yew. 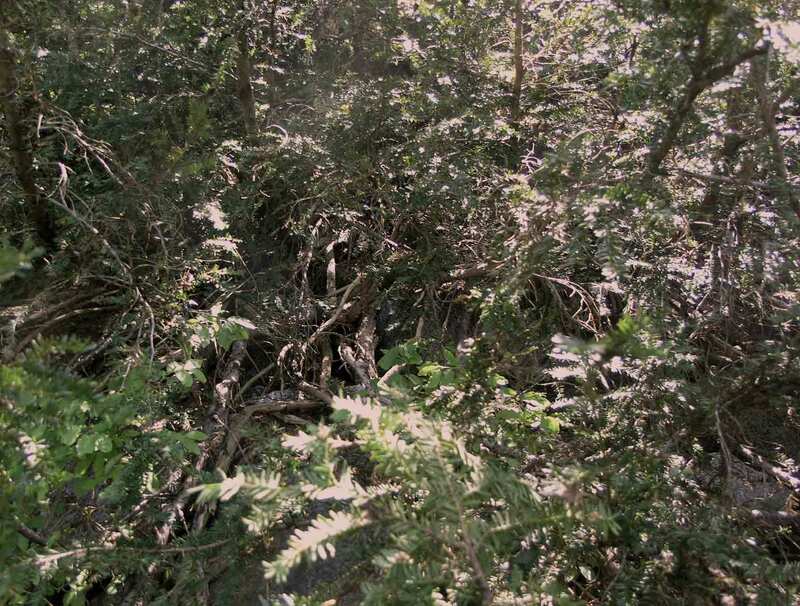 Genets were still thriving downstream but not growing closely around the base of conifers as shown here. 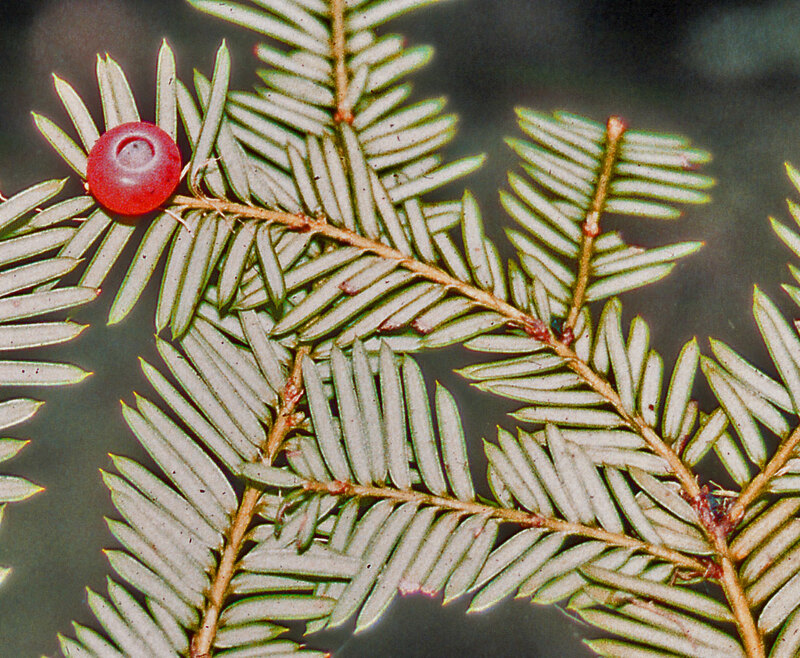 Three photos of Taxus brevifolia var. reptaneta from Icicle Creek taken July 2010 (Spjut 16723). 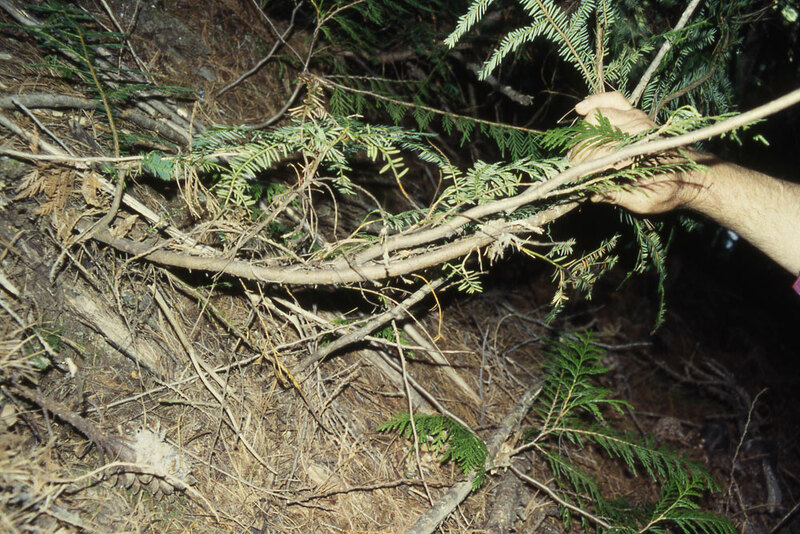 Left (or top): habit of genet (in part) with clonal individuals (ramets), the main stem of each ramet ascending and bearing long divaricate to descending branches off to one one side of the stem. Center: two fertile branches, one with a bi-ovulate cone, another with two ovules arising in the axils of successive leaves. Right (or bottom) Two ovules at the end of a short primary (fertile) shoot, and possibly another fertile shoot aborting development, or could develop into a vegetative shoot. Canada—British Columbia: Between Rocky Mountain National Park and Glacier National Park, 2.5 mi W of Golden, S off Hwy 1, S of Big Lake Resort, elev. 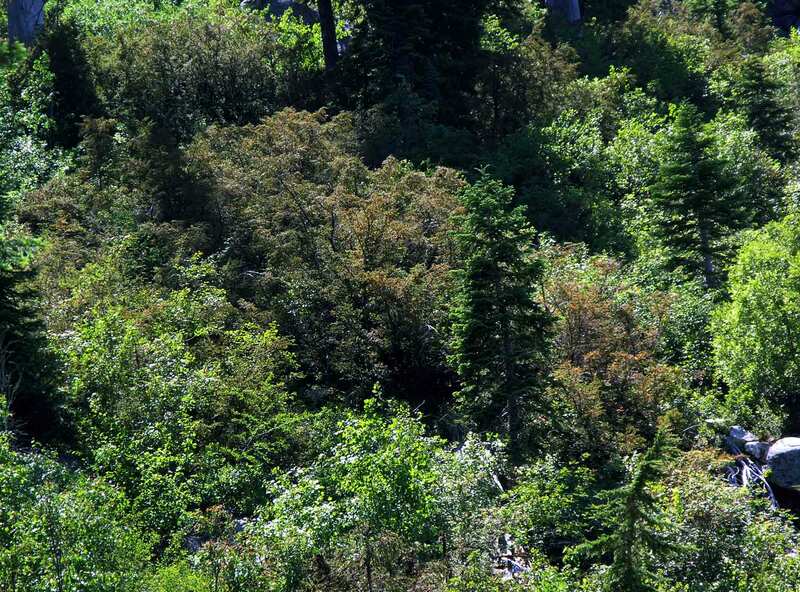 ~1000 m. On steep rocky slopes of narrow ravine, occurring with Douglas fir, western red cedar, maple and hazelnut, Spjut 12090. 4 Aug 1991. 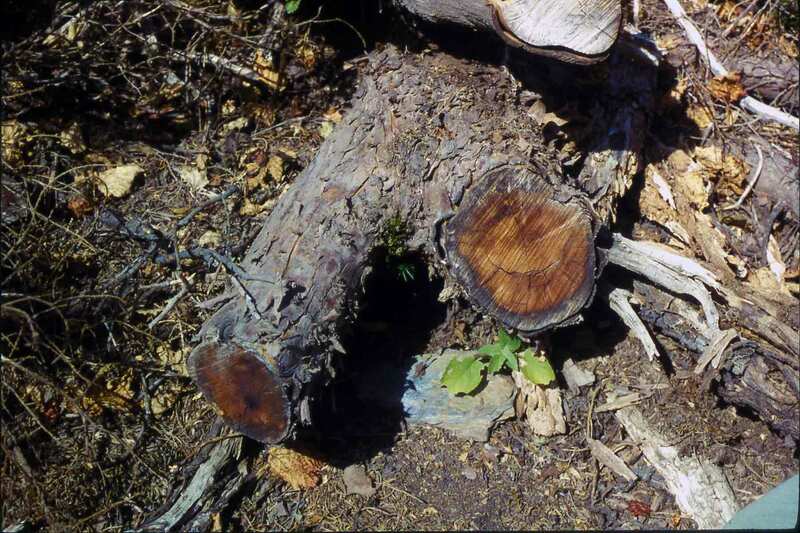 Stems appear to develop a basal burl, but no plants were dug up to confirm this observation. California. Klamath Natl. Forest: West side of Etna Summit along Etna-Sawyer's Bar Road at jct of Taylor Creek and Russian Creek; 41º22'08.94, 23º01'34.11", 3550 ft. 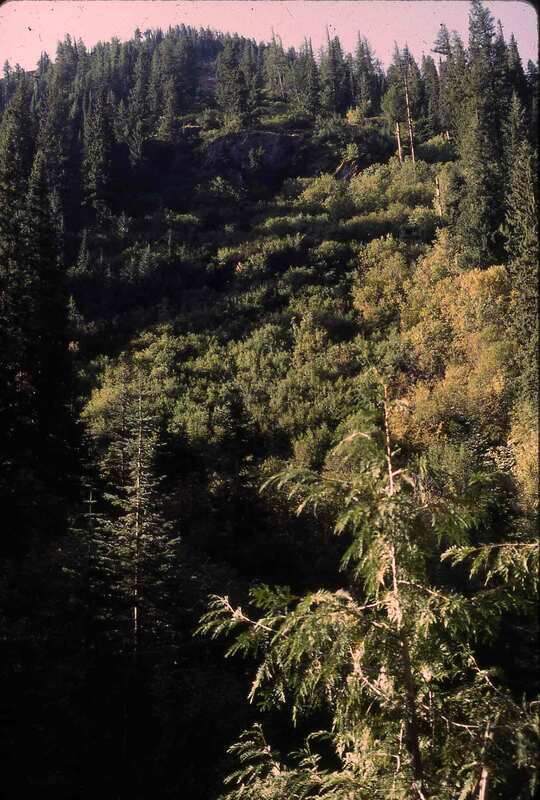 Steep north-facing ravine in Douglas fir forest. Shrub with several or more basal stems arising from an old large prostrate stem; stems sharply ascend near base, 2–4 m high; branching not spiral but in one plane with many branches spreading in the same direction from the main stem; foliage dark green. Population of few genets, each with many individuals (ramets). 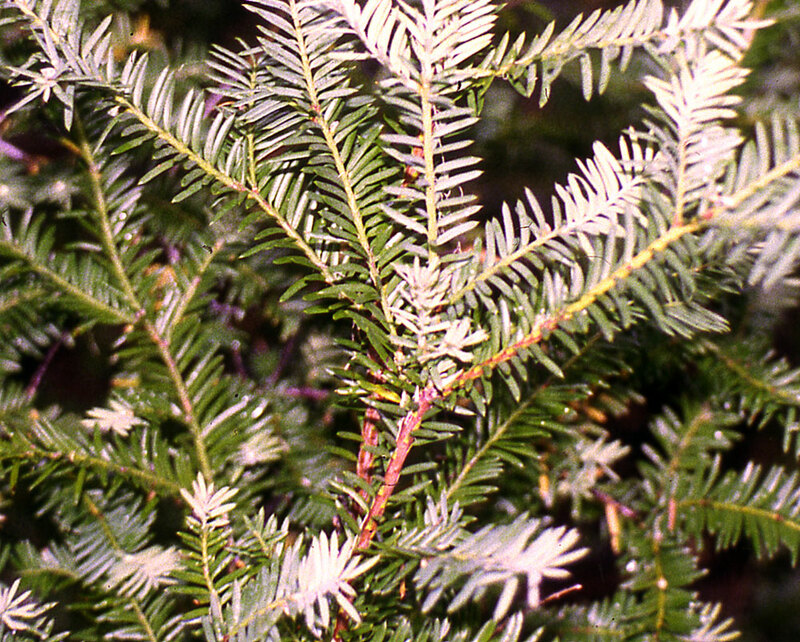 Note smooth bark and gray color, similar to a young Abies. SPJ-16770, female genet with developing seeds. NW Montana. Lincoln Co., near northern panhandle of Idaho, Kootenai National Forest, Libby Mt., Snowshoe Mine Road, T28N R31W Sec. 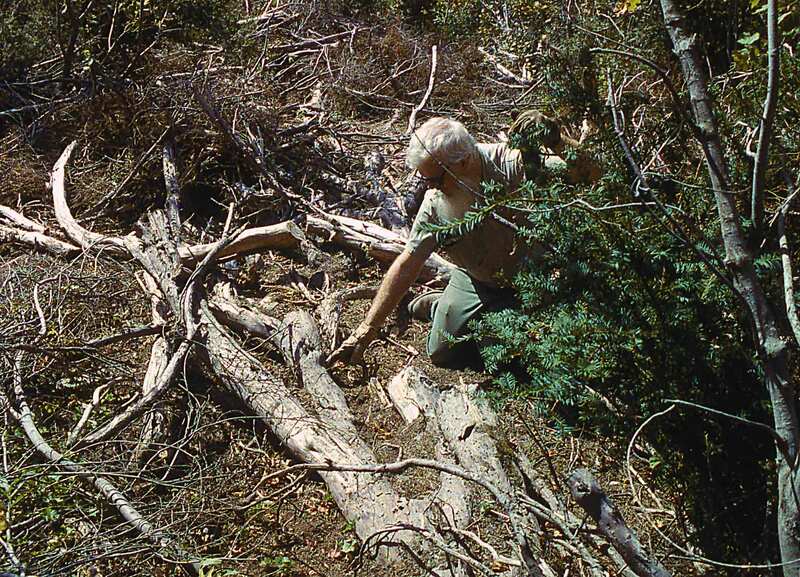 495, Top photos— provided by David Deevy—shows thicket of yew before collectors debarked stems. 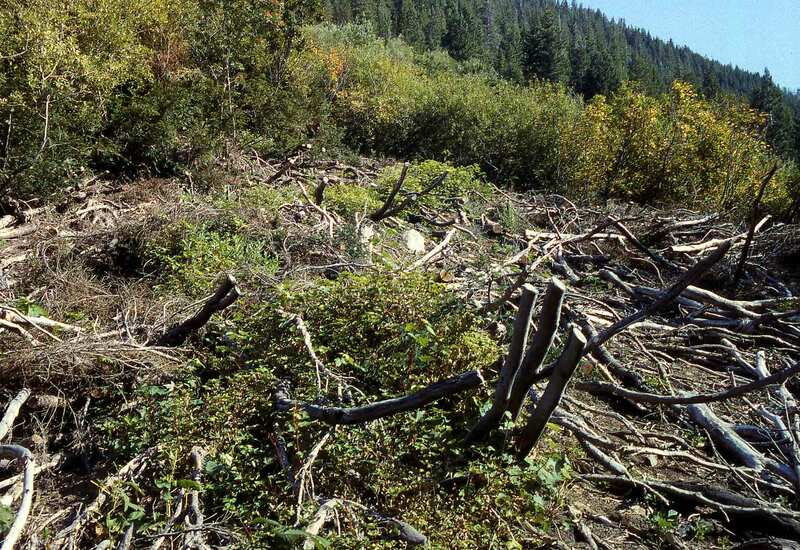 Right photo shows a good view of the habit of the plant after collectors removed branches and bark from plants. 17 Aug 1992. Montana: Flat Head NF, Swan Lake Dist. Big Head, Bay Creek road (FS Road 129), T25N R 18W Sec 6; Spjut & Broster 12308. 18 Aug 1992. 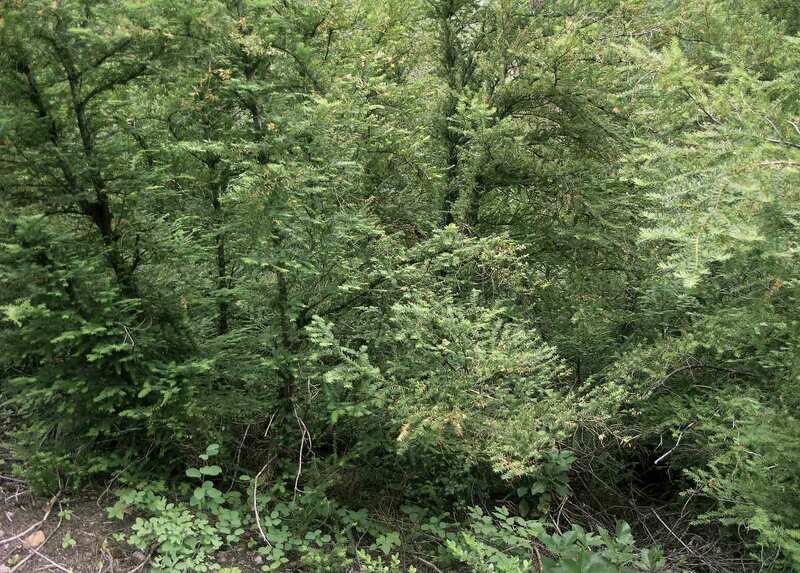 Showing low creeping habit much like T. canadensis, also in the vicinity one large tree of typical T. brevifolia. 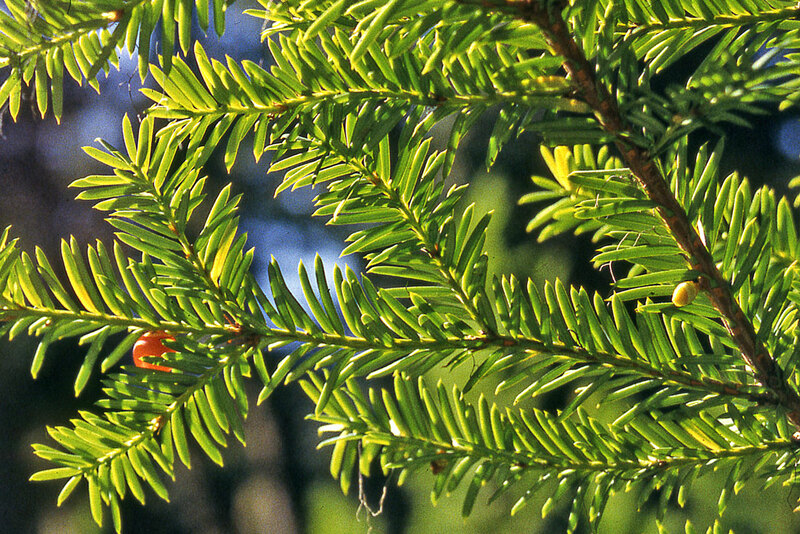 In studies with assistance from the USDA Forest Service in the Pacific Northwest Region, the author was directed to many other sites during Aug 1992 where "shrub yew" was known. At least four distinct growth forms were recognized in the Klamath Region, Eastern Cascades, and Rocky Mountains. But these forms could only be distinguished in the field, not from herbarium material alone. Nevertheless, each seemed worthy of taxonomic status. 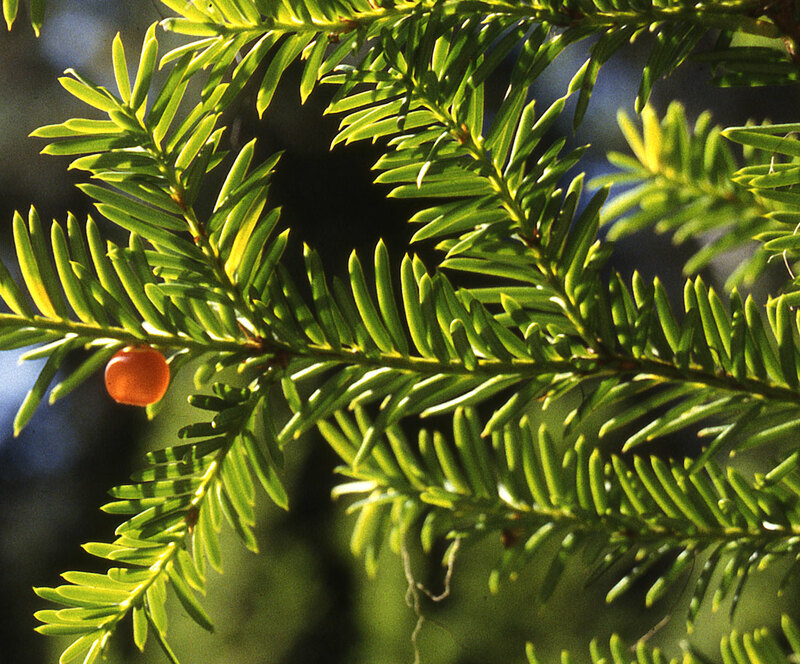 Samples from each of these and also of the typical tree variety (var. 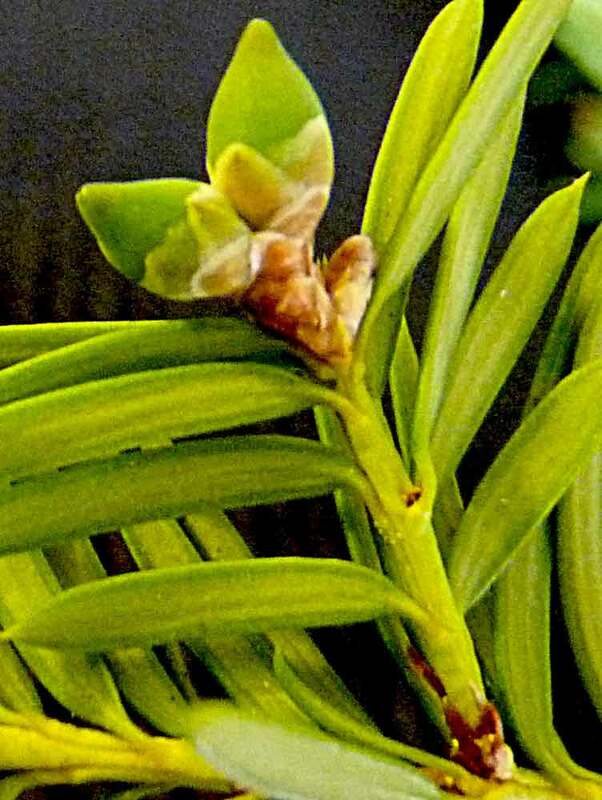 brevifolia) were obtained for taxoid analysis by Professor C.-j Chang. 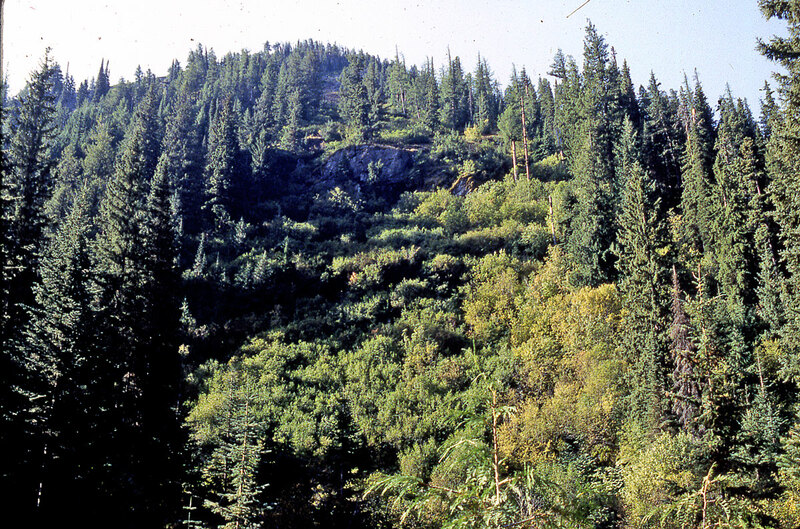 The NW Montana collection with David Deevy and samples from the type locality near the Forks-of-the-Salmon in California showed remarkably similar taxoid content, and were clearly distinct from samples of var. brevifolia (Spjut et al. 1993). 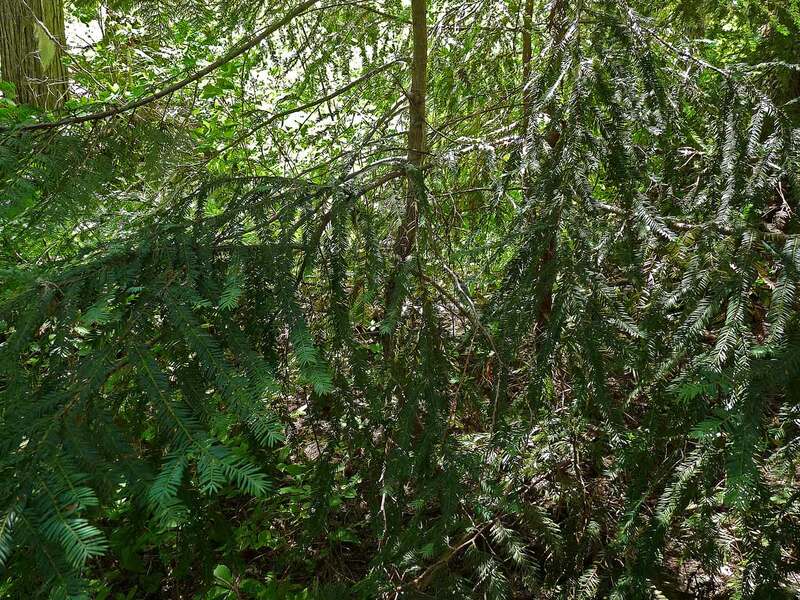 Dr. Chang felt that this was sufficient evidence for recognizing it as a distinct species; however, one cannot simply ignore the other shrub samples; they too had to be dealt with before any new species could be described. Fifteen years later, var. reptaneta still appears to be a distinct species. 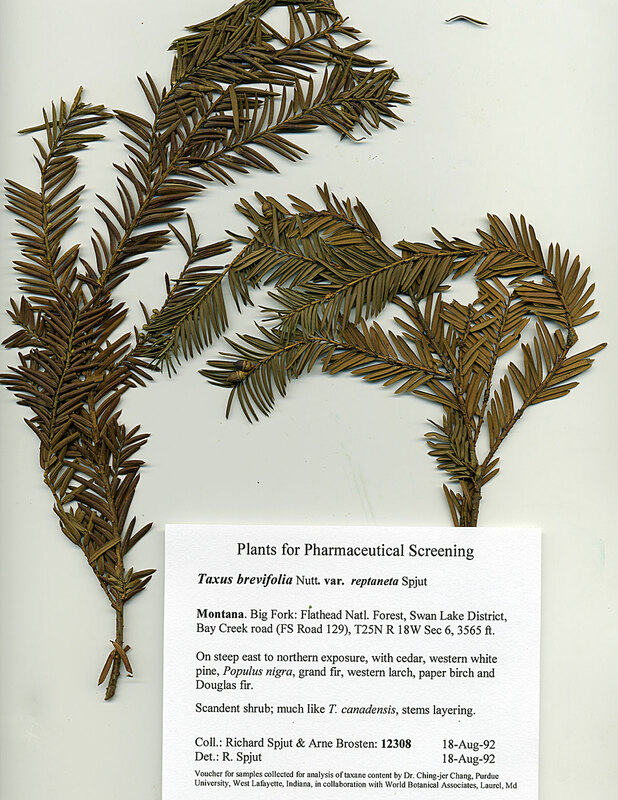 The problem remains, however, even with support from molecular data, that one should be able distinguish a species in herbarium specimens using morphological characters, and there is also the question of whether all shrub forms belong to a distinct species with many varieties or should be simply treated as a single variety as I have done here. Nonetheless, the various shrub forms all show the diagnostic features of ascending stems and branches spreading more to one side than equally all around the stem. 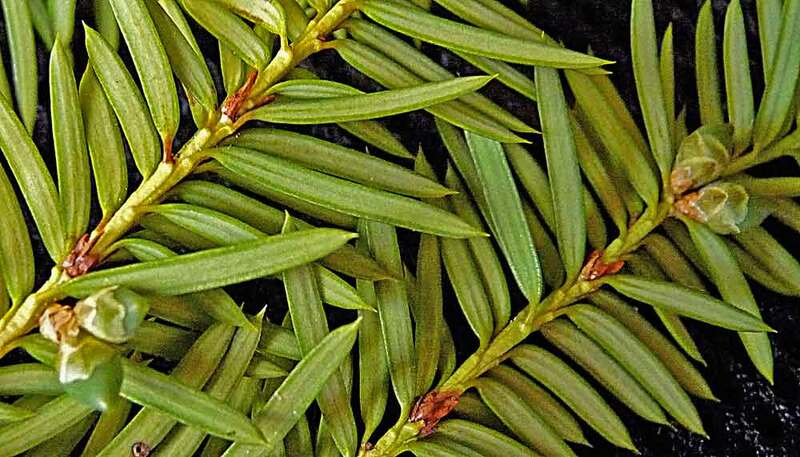 Additionally, fertile shoots may have biovulate cones, or two terminal cones where only one bears one or more ovules, or ovules develop in successive leaves so as to appear biovulate as often seen in T. baccata var. dovastoniana. 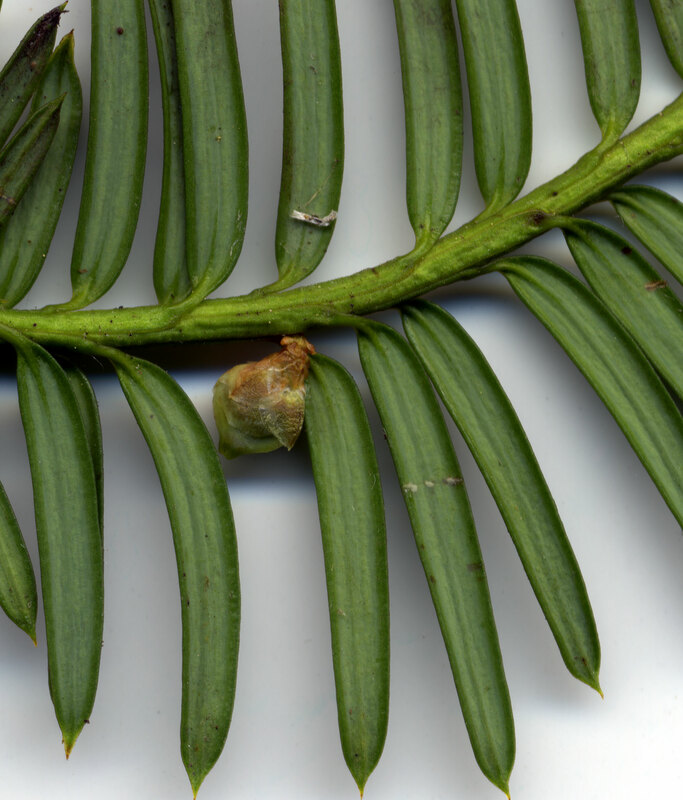 These findings would seem to indicate that ovuliferous shoots (as well as male strobili) in Taxus are not strictly axillary to a leaf. Spjut, R. W. 2007b. 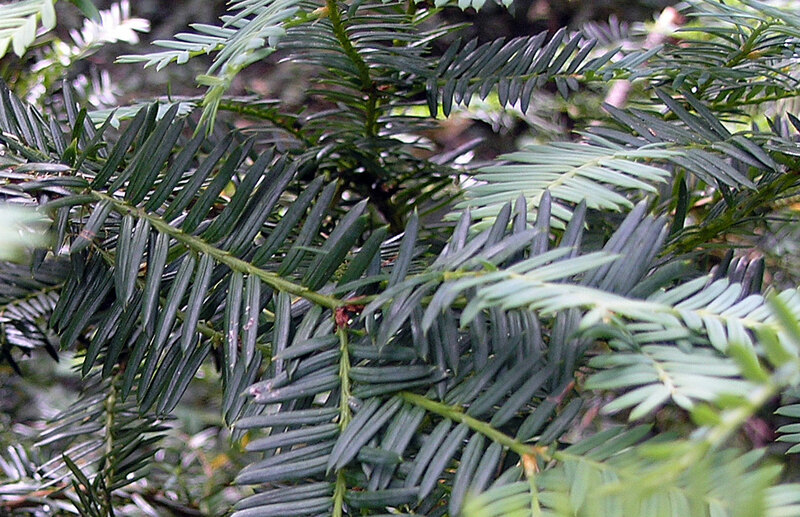 Taxonomy and nomenclature of Taxus. J. Bot. Res. Inst. Texas 1(1): 203–289.